Who is the Department of Foreign Affairs and International Trade Canada (DFATD) Authentication and Service of Document Section (JLAC) and what do they do? You Are Here:Home/Authentication and Legalization Process/Who is the Department of Foreign Affairs and International Trade Canada (DFATD) Authentication and Service of Document Section (JLAC) and what do they do? To answer these questions let us start by explaining what the authentication of a document is. When a document needs to be used in another country from where it originates it must follow a certain process in order to remove the burden of proof of validity from the person who is receiving it. To achieve this a countries recognised authority, which here in Canada is the Department of Foreign Affairs and International Trade Canada (DFATD) Authentication and Service of Document Section (JLAC), will authenticate the document as the first step in removing that burden of proof. The purpose of this specialized department is to authenticate the signature on certain types of documents by checking in its registry to confirm that in fact the signature on the document is valid. 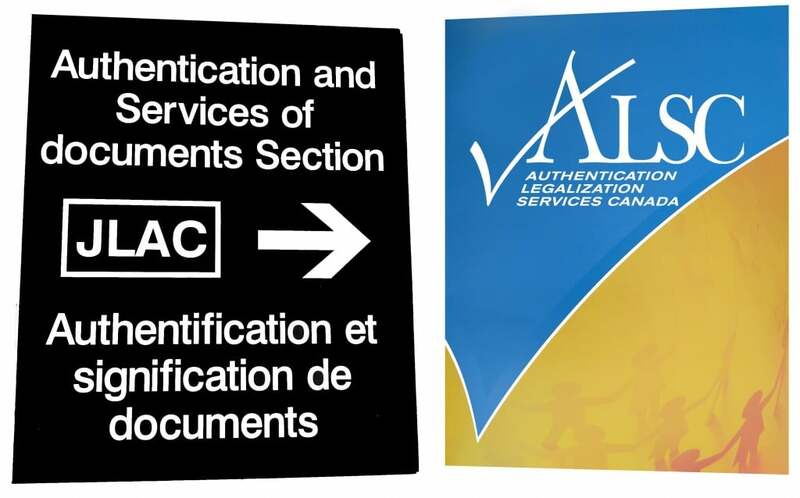 See the different types of documents we can assist you with authentication at the Foreign Affairs Canada here. How does Foreign Affairs Canada authenticate documents? In order to qualify the document must bear a signature that is on file with the Authentication and Service of Document Section (JLAC). The JLAC registry includes signatures from various different professions and agencies. Once JLAC is satisfied that the signature on the document is the same as in their registry they will affix a red stamp to the document bearing the crest of the department with the statement “The Department of Foreign Affairs and International Trade Canada has duly authenticated the foregoing signature of ____________________”. Further noting the JLAC officers name and signature that has authenticated the document. To be clear on their role JLAC does not review or qualify the content of any documents although per its rule if they determine any document is misleading or that it may be used for fraudulent purpose they will not authenticate the document. Most documents if meeting DFATD requirements and bearing the required signature will qualify although religious documents cannot be authenticated. One of the other important functions of JLAC is the issuance of Statements in lieu of a Certificate of Non-Impediment to Marriage Abroad for persons wishing to marry in a country where such a document is required. By Authentication Legalization Canada|2017-09-18T16:10:33+00:00December 4th, 2013|Authentication and Legalization Process|Comments Off on Who is the Department of Foreign Affairs and International Trade Canada (DFATD) Authentication and Service of Document Section (JLAC) and what do they do?